The United States Department of State approved the sale of 24 multi-role MH-60 Romeo Seahawk helicopters to India at a price of USD 2.4 billion (Rs 16,516 crore). The Lockheed Martin-built helicopters will replace India's ageing fleet of British-made Sea King helicopters. 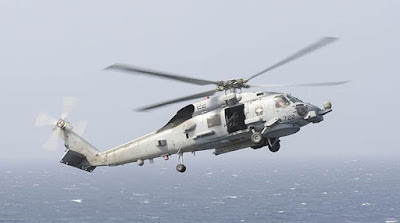 MH-60 Romeo Seahawk helicopters are considered as the most capable naval helicopters available today and are currently deployed with the US Navy as the primary anti-submarine warfare anti-surface weapon system for open ocean and littoral zones. Q. Which country approved the sale of 24 multi-role MH-60 Romeo Seahawk helicopters to India at a price of USD 2.4 billion (Rs 16,516 crore)?